There are many forms of chopsticks from simple disposable chopsticks to handcrafted chopsticks using centuries-old techniques. The most common non-disposable chopstick is what we call the everyday chopstick. This is what you find in most gift shops and Asian grocery stores. They are durable, come in an endless array of colors and designs, and cost just a few dollars. Here we'll describe the production process for the manufacture of everyday chopsticks. The core of the chopstick is made of either wood or bamboo. Bamboo is slightly less expensive and perhaps a more renewable resource, but can be a little more prone to warping. Wood chopsticks are made from wood varieties similar to alder. The wood is cut or split into lengths about 1-1/2 times the length of one chopstick. This wood blank will make one chopstick with room in the middle for handling during the finish process. The blank is milled down to the final shape of the chopstick and sanded smooth in preparation for the painting process. 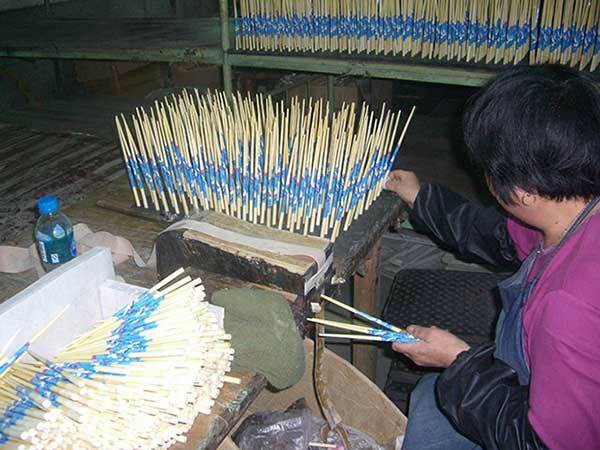 Virtually all chopsticks are made to order from the factory. Base wood, length, thickness, tip thickness and style, finish design and quality, and final packaging are all specified prior to production. Typically a buyer must order between 5,000 to 10,000 of each color and style from the factory. Therefore there are differences in quality from one seller's chopsticks to the next depending on the quality of finish and packaging. For instance chopsticks produced for the domestic Chinese market tend to have 1-3 layers of paint finish while chopsticks for the Japanese and United States usually have 4-5 layers, making for a richer, deeper-colored and more durable final look, and are called "Japanese #1" style. The first 2 layers of the Japanese #1 style chopstick are a primer or sealer. Between each coat the primer is sanded smooth. Clear lacquered chopsticks do not use a primer. Then 2 coats of the color layer are applied to form a rich, deep color. At this point many chopsticks receive a design, typically on the handle. Although sometimes this decoration or design is hand painted, almost all chopsticks have applied a decal-like pre-printed layer. This decal is called a heat stamp and is sometimes applied at a different factory that specializes in making and applying the heat stamps. Once the heat stamp is applied, a final clear coat finish is applied to seal the body of the chopstick. During this entire process the stick has retained an extra length for holding the stick while painting and finishing. Once the body is finished the end is trimmed and finished by dipping or painting, sometimes in a contrasting color. Next, chopsticks are joined into pairs with a sticker wrap at their middle. The sticks are generally carefully aligned so their design continues across both sticks. Then the chopsticks are typically inserted into a clear plastic sealed envelope, referred to as an "OPP bag". This protects the chopsticks and keeps them clean while on display at the store and while in storage. Finally the chopsticks are bundled into bags of 100 pairs or boxes of 50 pairs, and packed in master cases of usually 1000 pairs for easy handling and distribution. This entire process typically takes about 45 days to allow proper drying of each paint layer. 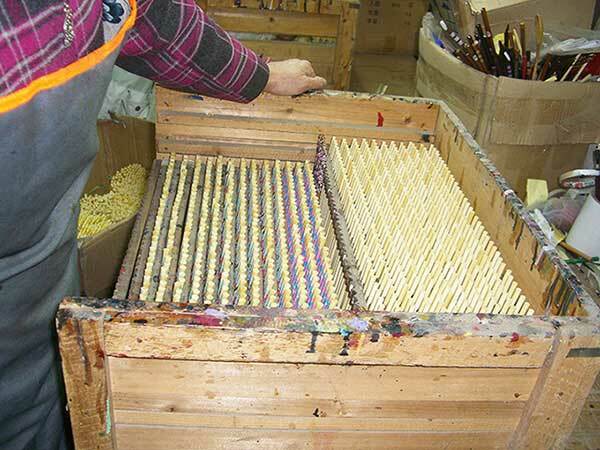 Remarkably the finish process is mostly done by hand as you can see in the attached photos from one of China's largest chopstick factories. This is in stark contrast to disposable chopsticks which are machine stamped and milled entirely. So that's an overview of how the simple everyday chopstick is made. See our other articles on how disposable chopsticks are made, and how different types of beautiful, handcrafted chopsticks such as Wakasa, Washi and Nishijin are produced. EverythingChopsticks.com has been a leading seller of chopsticks in the United States since 2005. Visit our website to see all the wonderful types of chopsticks we have to offer including our large selection of personalized chopsticks.